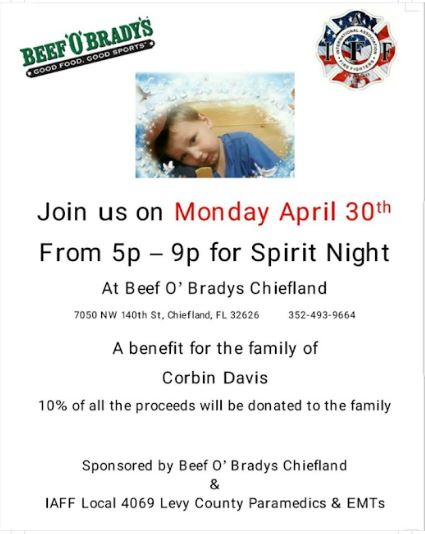 For our media partners who may be able to attend and help us honor Corbin in support of his parents Kevin and Renae Davis. The Levy County Sheriff’s Office Family suffered our own loss this week. Deputy Kevin Davis and his wife, Correctional Assistant Renae Davis lost their 3 year old son Corbin. Corbin was taken home to be with our Lord unexpectedly in a drowning accident on Saturday, April 21, 2018. Corbin leaves behind two brothers and one sister; ages 10, 5 and 6 months. The following is the official donation site to benefit the Davis Family. A fundraising benefit has been arranged by the IAFF Local 4069 Levy County Paramedics and EMT’s at Beef O’Brady’s in Chiefland on Monday, April 30, 2018. Media staging area is in the field next to Duke Energy on SR 26 at the east city limits of Trenton.